Infinitely-funded Manchester United faced Ajax – a side with an average age of under 23 – in the Europa League final. 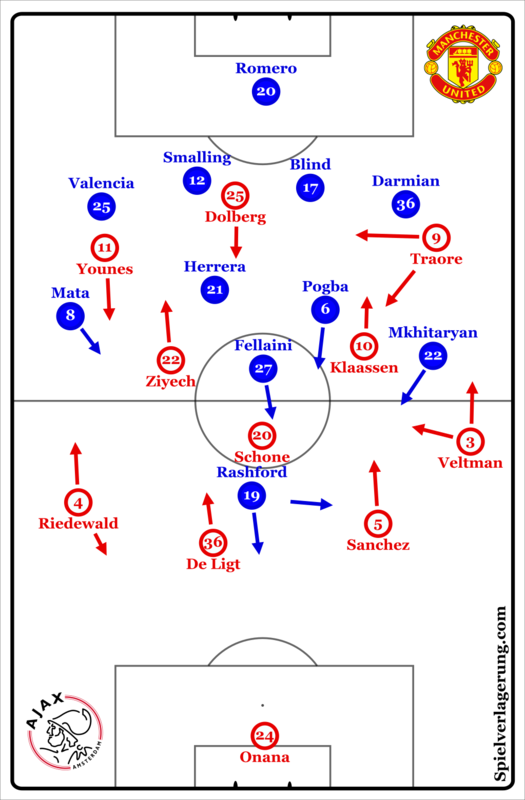 What followed was a typical Mourinho game in which he effectively shut-down the most threatening qualities of the opposition’s attack, while using a low-risk approach with the ball. Although United spent more time in a mid-block which was passive against Ajax’s centre-backs, Rashford began the game trying to close down one of Sanchez or De Ligt. The young forward would press horizontally, so that he would cut off the connection between the Ajax defenders. Given that Ajax looked to build mainly through Sanchez, it was often the Colombian who he was pressing with De Ligt in his shadow. Sanchez’ options ahead of him were covered by United’s man-oriented press while Mkhitaryan was given the licence to also close down the space in front of Sanchez while covering the pass to Veltman. Yet due to Rashford’s higher positioning, Ajax were able to quite easily free-up the opposite centre-back through simple bounce-passes with a central midfielder. Sanchez would advance, drawing Rashford with him before playing into Schöne or Klaasen who would make a wall-pass to De Ligt. With this passing pattern breaking Rashford’s access, the striker soon dropped into a deeper positioning and became more passive against the ball-carrier. Thus, his role changed from closing down the ball-carrier to blocking any passing lanes into the centre of midfield. This more conservative role ensured that he didn’t waste energy trying to press in vain, while still restricting Ajax’s ability to advance the ball through the middle third. Now with Rashford deeper, United’s defensive approach became extremely cautious. They were passive when Sanchez or De Ligt had the ball and would only press when the ball moved into the midfield spaces. It seemed as though they intentionally wanted Sanchez to carry the ball forward, which would leave Rashford against De Ligt in the case of a turnover. Despite being man-oriented, they were able to maintain quite a high level of compactness in the centre due to intelligent positioning from the three midfielders. In the case of Pogba and Fellaini, they could use their physical superiority against Klaassen and Schöne respectively. While Bosz was criticised for not having a plan to break free from United’s press, Ajax did have some methods to progress through the midfield. They were simply executed poorly. As they have done in past games against man-marking, Ajax sought to find Dolberg through vertical passes from the first line. The young striker would frequently drop from the opposing centre-back’s blind-side and look to receive passes from Sanchez. Theoretically, the three central midfielders can manipulate the positioning of their markers to create lanes through which Dolberg can be found, offering a way to progress the ball quickly towards goal. However, Ajax struggled to create these passing lanes as frequently as they do against Eredivisie opponents. In this respect, credit must be given to Mourinho’s side who used man-orientations quite flexibly to ensure that their structure wasn’t too reactive. As the ball-far central midfielder in most scenes, Herrera adjusted his positioning well to make some coverage of the spaces in front of the defensive line while maintaining access to Ziyech. But Ajax were also their own enemies at times. Davinson Sanchez, who is usually quite capable in passing the ball, was horrendously inaccurate which could’ve been explained by a number of psychological or technical-tactical reasons. Dolberg’s movement wasn’t very effective too, and was often too late so that when he dropped to receive the pass, the ball had already moved on or the passing lane was closed. Bosz side were also able to find Traore as the free-man in a number of situations. The right-winger drifted inside to the point where Darmian was reluctant to follow, meaning that the Chelsea-loanee was able to be free amongst the central midfielders. And Ajax were occasionally able to access the Burkinabé winger, allowing a progression from the first line into midfield. Yet they could rarely develop these situations into anything more. United’s low-block meant that the winger was entering and receiving in spaces which were crowded with both teammates and opponents, giving him limited room to operate in. 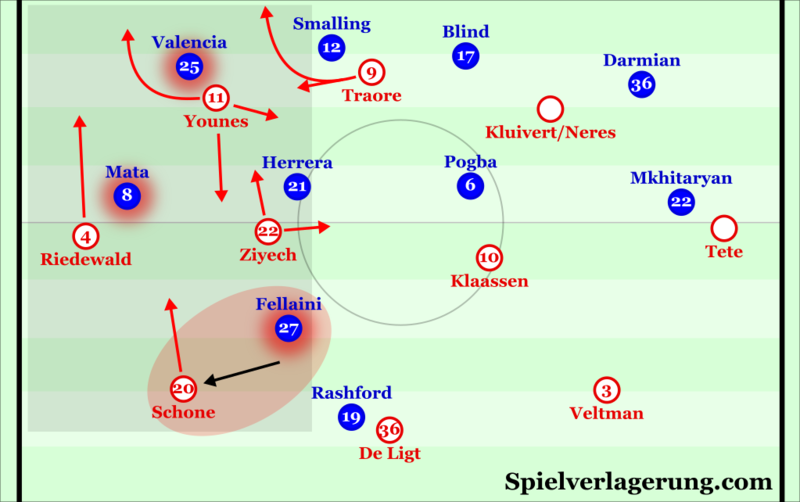 Furthermore, with Younes playing extremely wide and Dolberg struggling to free himself from Smalling and Blind, Ajax struggled to create the subsequent free-man when Traore had the ball. As a result of these issues, Ajax were unable to consistently progress up the field. There were some potential solutions to their predicament, though. Due to both Ajax’s offensive game and United’s defensive approach, the two key roles for Bosz were the right centre-back and the striker. Unfortunately for them, both players made underwhelming games. Much of United’s game-plan was predicated on Davinson Sánchez’ inability to take advantage of being the free-man in build-up. His ability to use andribbeln to find a free player in higher zones was ineffective with some quite poor passing. And because Sánchez was unable to create space higher through individual actions, United were able to allow him to advance with the ball while covering his immediate options. Bosz’ side may have had more success if they had moved Veltman into the right centre-back position from his role as a right-back. The Ajax captain is much more competent on the ball than Sánchez, and may have been able to play more penetrative passes and use his andribbeln more effectively. Some of their best build-ups actually came when the right-back moved into the half-space, where he was able to play diagonally back inside and find an open teammate. As I alluded to earlier, Dolberg’s poorly-timed movement meant that he was unable to free himself and help his team progress. He was often too late to receive a pass and alternatively, offered little threat in running into depth. In contrast, Bertrand Traore has already proved himself as a capable striker in such a role of receiving direct passes from his centre-backs. Thus it could have been a plausible move to bring Traore inside permanently, in place of Dolberg who failed to help his side progress. Bosz actually did make this change, with 30 minutes to remain. But with United owning a 2-0 lead, the game was pretty much dead with Mourinho’s team becoming extremely reserved both with and without the ball. At this stage, it was difficult for Traore to have a significant impact, though he was able to receive a small number of vertical passes from Sánchez. 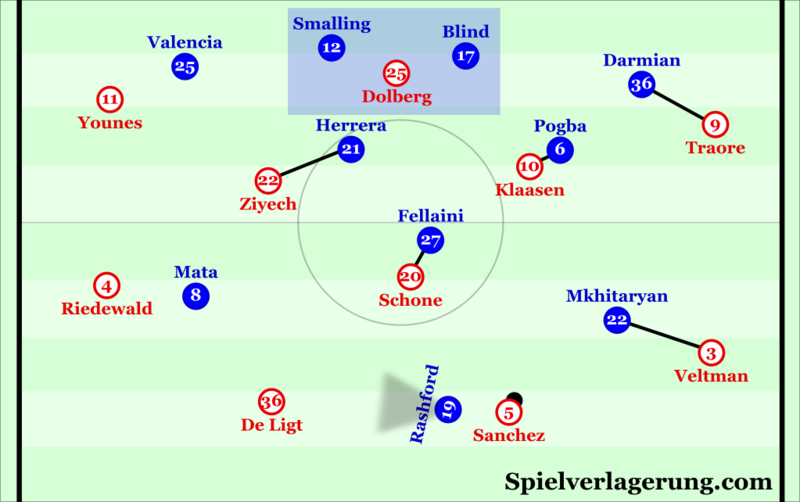 With Schöne dropping to the left side of the first line (opposed to the right as Mata was positioned deeper than Mkhitaryan, meaning that they would have had worse access in higher-up spaces), Fellaini is immediately posed with the decision of whether to follow him or whether to stay central. If he follows, then there should be more space in the centre for the dropping movements of the three forwards. As previously stated – one of the issues with Traore coming inside from the right was that he was entering a crowded area. If Fellaini doesn’t follow Schöne, then he would be able to advance with the ball to create an overload through the left half-space. He would also be in a good position to play a range of different penetrative passes to the four players ahead of him. With Younes inside and Traore as striker, it could become possible to create a decisional crisis for Valencia. If Younes drops, then Traore can attack the space behind Valencia if he decides to follow the German. Whereas if Valencia doesn’t track Younes, then the German can obviously act as the free-man. Similarly, if Mata follows Riedewald then depth opens up for Schöne, Younes or even Ziyech to utilise. If he (less likely) decides to maintain his positioning and perhaps cover the pass into Younes, then Valencia could be stretched by a run from Traore too. While Schöne is on the left side, Veltman would be on the right instead of Davinson Sánchez who had a disappointing game. From this position, the defender would have been able to utilise his playmaking ability better than on the right touchline. 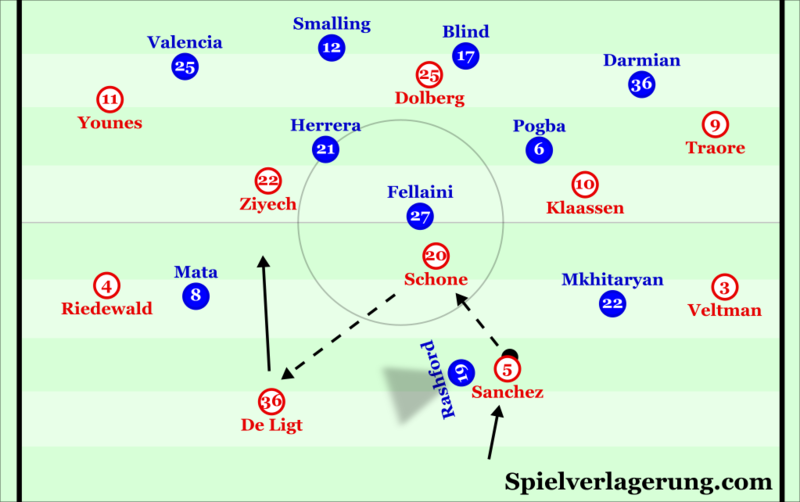 As more of a general point – it was clear that United came with a very good and planned defensive plan for Ajax’s attack. On this basis, it’s more likely that a structural or dynamical change could have been successful. United’s game-plan would essentially have been ‘out-dated’. Mourinho explained his in-possession strategy clearly in the post-match press conference: “If you want to press the ball all the time, you don’t play short”. Coming into the game, United understood that their opponents would press high as they do in every game. Knowing this, the English side made little attempt to build possession with short passes, and instead used Fellaini as a target man to play directly. Doing so not only allowed them to nullify Ajax’s press, but enabled them to exploit the physical superiority of Fellaini over Schöne. Their direct game wasn’t particularly threatening – but after Pogba’s early goal – it didn’t need to be as long as the defence continued to be resolute. It was simply a low-risk approach which minimised the chance of their defence being open in transition. Mourinho and his United team fully deserved to win after a pragmatic and effective defensive performance, no matter how boring it was to watch. Ajax approached the game quite poorly from a strategical perspective, and could’ve perhaps adapted better during the game when United had clearly sterilised their possession game.